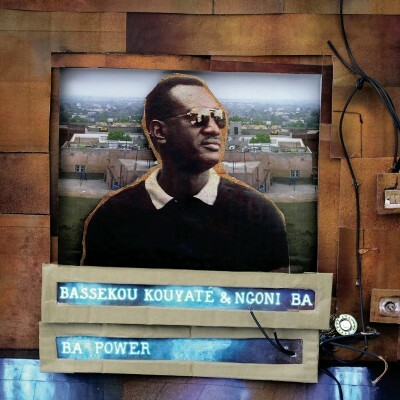 Bassekou Kouyaté & Ngoni Ba’s fourth album Ba Power (and his first for Glitterbeat Records) is a striking, career defining record marked by mesmerizing songs, razor-sharp riffs and full-throttle emotions. Bassekou’s band, Ngoni Ba, has turned up the volume and dynamics significantly and Bassekou’s masterful ngoni playing has achieved a new level of intensity that can only be called: afro-rock. This is not the same Ngoni Ba. This is indeed: Ba Power. Without question Bassekou Kouyaté & Ngoni Ba has revolutionized the sound and narrative possibilities of the ngoni, the lute-like instrument that is essential to Mali’s Griot culture. Bassekou was born into this resonant tradition but his relationship to it has been anything but static. From the beginning of his career, through his invention of a previously unheard repertoire built around the melodies and rhythms of four interlocking (and at times electric) ngonis, Bassekou has demonstrated his respect for the past by radically pulling it into the future. Over the last decade, Bassekou has firmly established himself as not only one of Mali’s, but as one of Africa’s premier global artists. A veteran of hundreds of worldwide concerts, including major festival appearances at Glastonbury, Roskilde and WOMAD, Bassekou has also garnered a lengthy list of critical accolades. 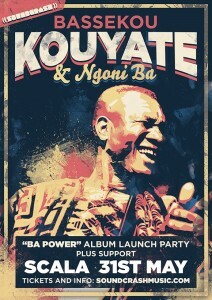 His debut album Segu Blue (2007) won two BBC Radio 3 Awards for World Music (‘Best Album’ and ‘Best African Artist’) and was voted the fRoots Album of the Year. The follow-up I Speak Fula (2009) was nominated for a Grammy Award. Jama Ko (2013) was named the Best World Music album in both Mojo magazine and Uncut magazines. The album was also #1 on the 2013 World Music Charts Europe (WMCE), and Songlines Magazine voted Bassekou, ‘Artist Of the Year’ for 2014.